A delegation of student leaders from the four Peralta Colleges – Berkeley City College, College of Alameda, Laney College and Merritt College – will be traveling to Washington, D.C., to attend the 45th Annual Congressional Black Caucus Legislative Conference. The students are being accompanied by Board President Meredith Brown, Trustee Linda Handy, who has coordinated and led the trips for 11 years, Chancellor Jowel Laguerre, Ph.D., and Interim Dean of Student Success and Equity, Lasana Hotep. Peralta’s delegation will receive a private tour of the U.S. Capitol building, go to a legislative advocacy seminar and briefing, and attend sessions of the Congressional Black Caucus conference. The nine students – among them student body presidents, student trustees, and other student leaders – will also attend a California Constituents breakfast at the Rayburn House Office Building. The students’ one-on-one meetings with Congresswoman Barbara Lee and other members of Congress will be the highlight of their trip. 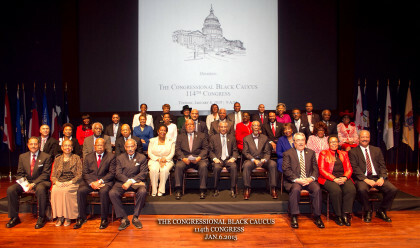 Established in 1971, the Congressional Black Caucus has served as the voice for people of color in Congress and seeks to ensure that everyone in the United States has an opportunity to achieve the American Dream. One of its main goals is universal access to education from birth through post-secondary school. Use #PeraltaCBC on social media to follow Peralta’s student leaders delegation at the Congressional Black Caucus Legislative Conference.